The plenary sessions of the conference will take place in Auditorium U2 of the Didactic Centre AGH, located at 7 Reymonta Street in Krak�w, which is within walking distance of the heart of the city. 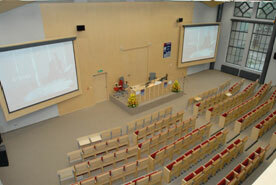 It is a newly renovated auditorium room with theatre seating. The Centre is well adapted to host handicapped guests. The Auditorium U2 is equipped with the WiFi system (of limited capacity). More pictures of the Centre are available here.